17 Qt Fairy Soil Made With Coconut Pulp and Added Nutrients. Professional growers are heralding coconut soil as the #1 choice in gardening for its numerous inherent qualities. HeirBloom soils are a superior eco-friendly alternative to peat moss. It absorbs 33% more water to prevent root rot and take any guesswork out of watering. 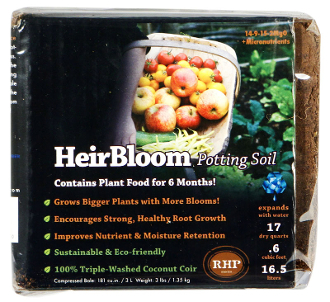 By being pH neutral and improving aeration, HeirBloom soil is ideal for all plants! Kit makes 17 Dry Quarts of Soil or 06 cu ft - ideal for miniature gardening!